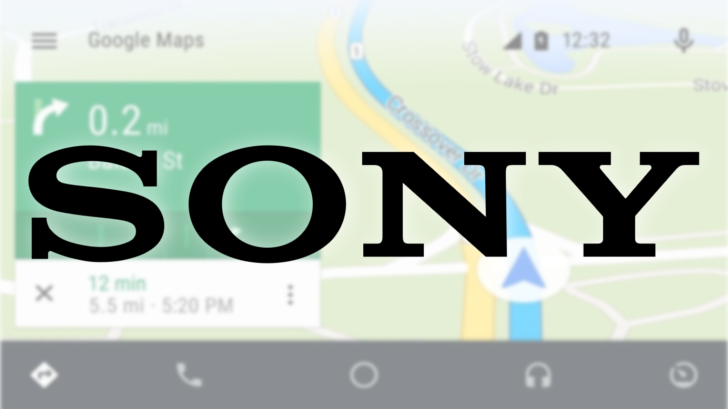 Sony's Android Auto head units are pretty popular around these parts. And that's for good reason, they present an excellent value for those interested in adding the hardware Android Auto experience to their car. Fortunately for Sony fans everywhere, the company has just announced a new product for its Android Auto lineup, the XAV-AX200. So far we don't have any pricing information or images of what the new model looks like. But if it lives up to the standards set by Sony's first Android Auto head unit, the XAV-AX100, then odds are you won't be disappointed. It's even billed as an "enhancement" to the previous model. Specs for the XAV-AX200 include a 6.4" touchscreen with the obvious support for Android Auto, as well as Apple CarPlay. It also includes a built-in DVD Player (what year is it? ), input for 3 external cameras, support for SiriusXM, and Bluetooth. More technical specs include 4V pre-out, 10Wx4 RMS/55Wx4 max output, Sony's "EXTRA BASS" sauce, a 10-band EQ, FLAC compatibility over USB, and configurable steering wheel remote input. Sony's previous model, the XAV-AX100. Most of those specs look to be pretty similar to the AX100, but the press release published lacks some significant details such as screen resolution and precise versions for things like Bluetooth. To be sure, we don't even know what it looks like yet. Sony did not include any images with the recent press release, so it could be an entirely new design. But with what we have on paper, the only real difference seems to be the DVD Player. So unless you're hankering to watch movies on your head unit, the older model might be a better value. If I had a garage to use, or if I drove my car enough to merit an upgrade, I might want to grab one of these, myself. But until Sony announces a date for retail availability, we'll all be waiting. Right now the only dates set for North America are "by the end of the year." Images and prices are up for it over at Amazon.de. So far, it looks pretty much identical to the AX100, excluding the addition of a DVD slot above the screen. There's no telling what the prices might be stateside, but those of you in the EU should be able to pick it up for 549€. The release date looks to be set at September 10th. SAN DIEGO, Aug. 14, 2017 /PRNewswire/ -- Sony Electronics announced today its XAV-AX200 and MEX-GS820BT in-car audio systems. 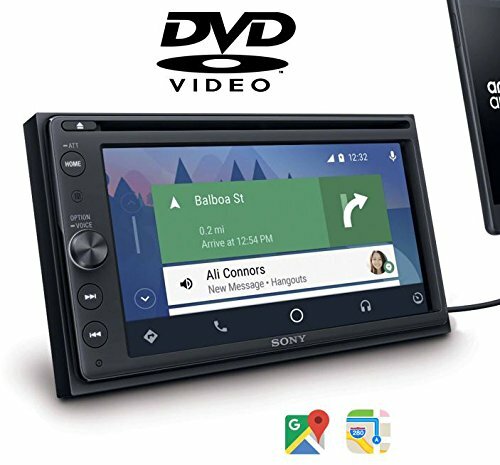 As an enhancement to the XAV-AX100 receiver, the XAV-AX200 DVD receiver offers the latest technology to make the most out of long car journeys, while the MEX-GS820BT works as a high power in-car receiver. Both technologies include the latest smartphone connectivity with exceptional user interface to use on-the-go. Apple CarPlay*: A smarter, safer way to use iPhone on the road. CarPlay seamlessly integrates iPhones with the car audio's display and controls. Drivers can make phone calls, access music, send and receive messages, get directions optimized for traffic conditions, and more while staying focused on the road. Android Auto™**: Android Auto extends the Android platform into the car in a way that's purpose-built for driving. With a simple and intuitive interface and powerful new voice actions, it's designed to minimize distraction so you can stay focused on the road. It automatically brings useful information organized into simple cards that appear when needed. A newly included built-in DVD Player brings favorite tunes and entertainment to life on every adventure. 3-External Camera Input: This newly introduced feature allows passengers to see a selected image among 3 connected cameras. One input relates to the reverse while the other two can be selected manually. SiriusXM Radio ready: Capable of providing a seamless, fully integrated satellite radio experience. High Voltage Pre-out (4V): Gives a powerful 4-volt signal that attains clearer sound with less distortion when the head unit is connected to the power amplifier. Bluetooth® technology offers hands-free calling and wireless audio streaming between mobile devices and the receiver with touchscreen phone book. 20Wx4 RMS /55Wx4 Max DRA2 with EXTRA BASS™ Circuitry***: A built-in 4-channel amplifier delivers 55 watts x 4(max. at 4 ohms) / 20 watts x 4 (RMS at 4 ohms) output power with DRA2 (Dynamic Reality Amp 2) power IC. The EXTRA BASS™ works to overcome engine noise and reproduce clear punchy sound at any volume level. Sound Optimization. The DSO (Dynamic Stage Organizer) creates ambient sound as if there were speakers on the dashboard. The 10-band equalizer (EQ10) with 10 pre-sets provides easy and effective frequency adjustment for various listening environments. FLAC Audio File Compatible (via USB terminal only): Free Lossless Audio Codec (FLAC), is an audio format similar to MP3, but with the difference that it compresses without any loss in quality. A Clear and Responsive 6.4-inch Touch Screen features 'lighter touch' operation with optimal visibility. Configurable Steering Wheel Remote Input covers general command protocol, so no adaptors are necessary for signal conversion between steering wheel and the head unit. Built-in Class-D Amp that gives an outstanding 100Wx4 Max/45Wx4 RMS that delivers incredible power in its compact size. The power supply block is optimally designed including choices of components and ideal circuit layout for low-noise, high efficient electric power transmission. Sophisticated Digital Signal Processing (DSP) function including time alignment enables drivers to freely adjust while creating a sound field ideal for the inside of the vehicle. The DSO (Dynamic Stage Organizer) creates a more ambient sound as if there were speakers on the dashboard. 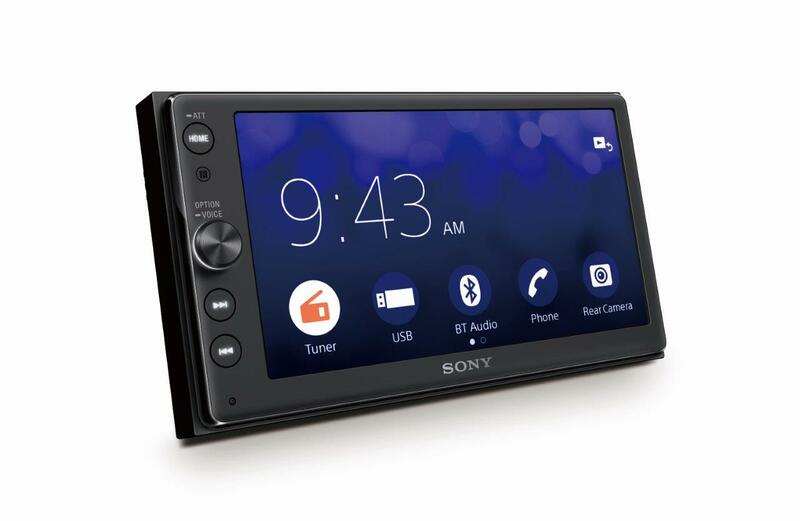 Dual Bluetooth® Connection with One-touch NFC Pairing****: Passengers get instant Bluetooth® pairing, connection/disconnection and activation of "Music Center," formerly SongPal, an Android/iOS app for smartphone integration with Sony car audio. Two devices can be connected at once. 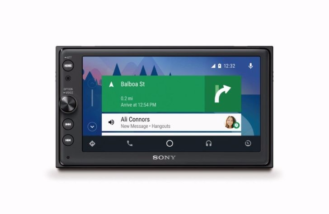 Voice Control on Android™ Phones: Voice commands available to get directions, play music, and communicate with contacts when connected with Android smartphones. System Expansion with Sony's XB Series Speakers: Drivers can connect Sony's best-matching XB series "Full Range" EXTRA BASS speakers, ideally designed for Sony's head units with EXTRA BASS circuitry. High Voltage Pre-out (5V): Sony's head unit with high voltage pre-out gives 5-volt signal, which realizes clearer sound with less distortion when the head unit is used connecting to power amplifier. AOA 2.0 Compatible Dual USB Terminal: The USB terminal supports AOA 2.0 (Android Open Accessory Protocol 2.0) in addition to MTP (Media Transform Protocol) and MSC (Mass Storage Class) connections. AOA 2.0 allows to play back music through a variety of music smartphone apps. 2-zone Dynamic Color Illuminator: Passengers can choose illumination color from up to 35,000 variation to match in-car decor with the Dynamic Color Illuminator, which allows users to set display color separately from that for key illuminations. Sound-synchronized Illumination: Brings dance club atmosphere to any car. Thanks to Sony's original beat sensing technology, the LED changes its color pulsing optimally to either sound pressure or back beat of the music for more enjoyable in-car decor. High Contrast Vertical Alignment LCD Display: VA (Vertical Alignment) LCD realizes 5 times higher contrast and wider viewing angle than conventional screen, providing improved visibility. The XAV-AX200 and MEX-GS820BT will be available across North America by the end of the year. For more Sony news, visit www.sony.com/news. ** Requires the Android Auto app on Google Play and on Android compatible smartphone running Android™ 5.0 Lollipop or higher. 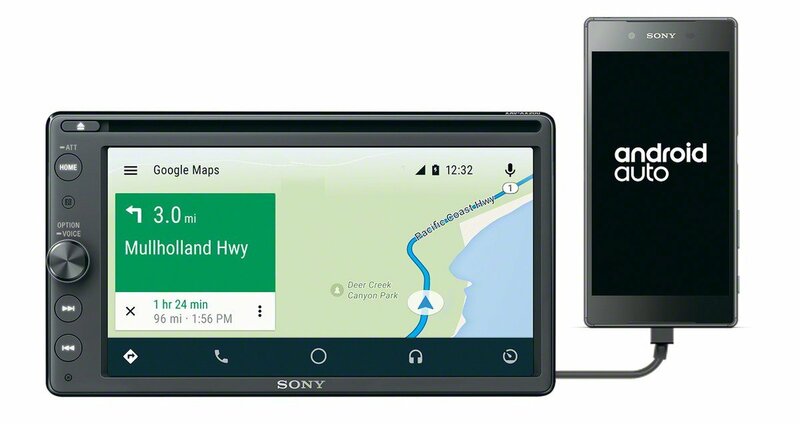 Android Auto™ may not be available on all devices and is not available in all countries or regions. Android, Android Auto, Google Play and other marks are trademarks of Google Inc.
**** Bluetooth function in the second phone is limited to hands-free call while the firstly connected device enables full options of Bluetooth wireless features including audio streaming. ***** Siri is available on iPhone 4s or later, iPad with Retina display, iPad mini, and iPod touch (5th generation) and requires Internet access. Siri may not be available in all languages or in all areas, and features may vary by area. Cellular data charges may apply. iPhone and Siri are trademarks of Apple, Inc.